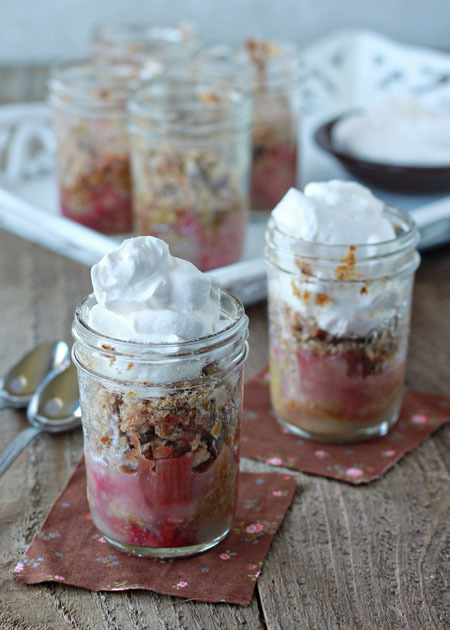 Tangy, ruby-pink rhubarb with buttery-crisp topping - baked and served right in its own individual-serving-size jar. Food (and drinks) in jars is pretty much the coolest concept ever. I mean, aside from aesthetics (they just look cute), it’s a highly convenient way to bake up cakes and pies – and make sangrias, even. They’re easy to assemble, tend to take up less room in the fridge, and are perfectly portable for gifts, parties, and lunches on the go. Even this awesome blogger wrote a cookbook all about it. So, yeah, I’m a fan. And so when I found myself with a few stalks of rhubarb (yay spring! 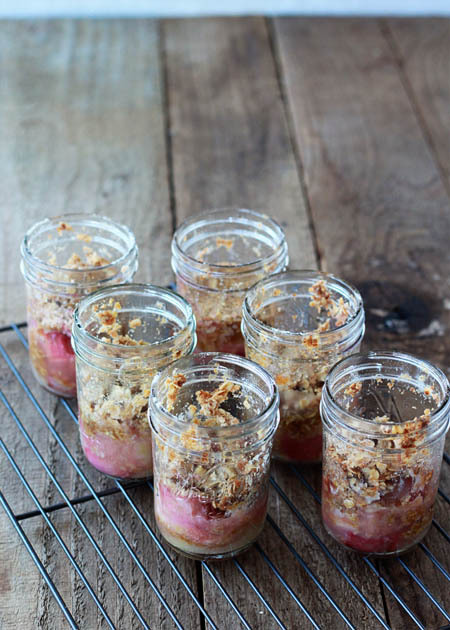 ), I decided to take my classic go-to rhubarb crisp recipe and try baking it up in jars instead of one big pan. 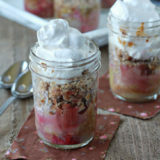 Rhubarb crisp! In a jar! Gosh, it’s a really good thing I’m attending a food writing class this month, because I think I need some inspiration. Let me try again. It’s just so cute and so awesome and so yummy! Jars excite me to the point of incoherence, I guess. Okay, so here’s the deal. This stuff is SO easy to make. You toss the rhubarb with some sugar and flour, then divide it between six jars. Whip up the crumbly, buttery topping, and throw that in the jar on top. And bake. 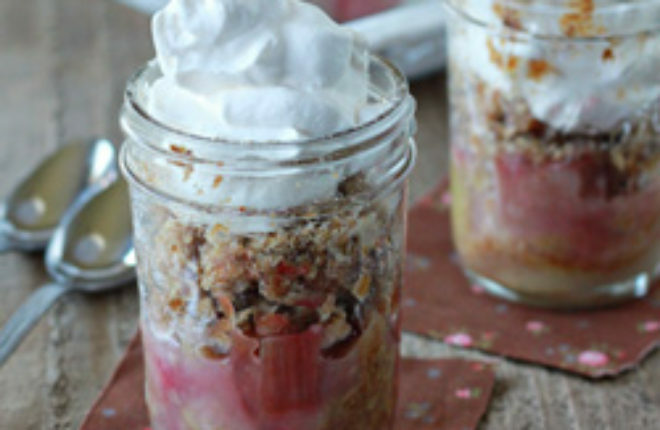 The rhubarb cooks down into sweet, tender, ruby bliss, and the oatmeal top gets nice and crunchy. This crisp does cook down quite a bit, so be warned. As far as I’m concerned, all the better. Because that way there’s a perfect spot for a dollop of whipped cream or a plop of ice cream. Serve with long spoons and enjoy the pure awesomeness of food in jars. Wash and dry six half-pint (8-ounce) canning jars. In a medium bowl, toss the rhubarb with the granulated sugar and 2 tablespoons flour. Divide rhubarb mixture between the six jars - each jar will fill nearly to the top with rhubarb. There will be some flour and sugar left over in the mixing bowl. Sprinkle the remaining mixture over the tops of the rhubarb. Using a long, narrow spoon or butter knife, give the rhubarb a stir to incorporate the remaining flour/sugar mixture. In a food processor, pulse the butter, 1/3 cup flour, brown sugar, rolled oats, and cinnamon until the butter is pea-sized. You can also do this in a medium bowl with a pastry blender, two butter knives, or even your hands. 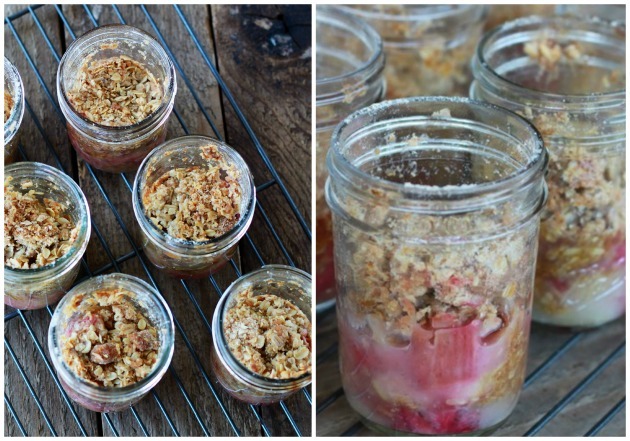 Divide the flour/oat mixture between each jar of rhubarb, sprinkling evenly on top. Place jars on a rimmed cookie sheet and bake for 30 minutes, or until the rhubarb is tender when you poke it with a fork, and the tops are crisp and golden. Let cool for at least fifteen minutes, or until jar is cool to the touch. You can serve after that, topping with whipped cream or ice cream if desired, or cool completely on a baking rack, add lids and tops, and store in the refrigerator for up to 3 days before serving. I could use a food writing class. I’ve been having the worst writer’s block lately. I just want to write about what happend on Real Housewives and then post my recipes. Why can’t I just do that?! I need to try rhubarb one of these days. I’m attempting to grow it in my garden, but so far the seeds just don’t want to sprout! and keep growing new bunches etc.